The Gospel of Matthew: the most Jewish gospel – For Christians, To be Born Again in Islam! The modern scholarship about the New Testament suggests that it was not written by the apostle Matthew but only attributed to him. Luke 4:4, Mathew 19:16-18 and John 15:10. Also see the knols about the Council of Jerusalem and Ebionites. Polar opposite to the Gospel of Mathew are the teachings of Paul condemning the Law that are tabulated in a comment below. In trying to develop relationship with God, man not only has to follow the genuine rituals of a true religion but also to implement the spirit of worship. That was the message of Jesus, may peace be on him. Unfortunately, St Paul misunderstood Jesus’ message and did away with form and only emphasized spirit. Every movement of sufism in the Abrahamic faiths follows the same tendency of Paul, of giving up the form or rituals and focusing on the spirit only. The complete and genuine course, however, is to follow both the letter and the spirit of any divine teachings, not only in worship but also in dealing with the fellow humans. This is what the Holy Quran teaches and this is also what the genuine portions of the Gospel of Matthew and the Gospel of Thomas teach. The Holy Quran says, “And the Jews say, ‘The Christians stand on nothing;’ and the Christians say, ‘The Jews stand on nothing;’ while they both read the same Book. Even thus said those who had no knowledge, like what they say. 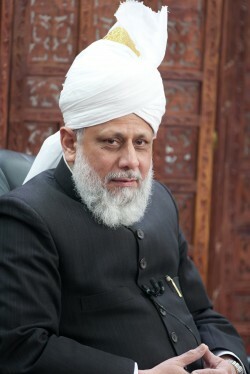 But Allah shall judge between them on the Day of Resurrection concerning that wherein they disagree.” (Al Quran 2:114) When we examine the New Testament, through the prism of the Quranic teachings in a Jewish paradigm, we begin to learn new details from the different Gospels that will be so helpful in bringing the Abrahmic faiths together. The most fertile text in this regard is the Gospel of Matthew that is considered to be the most Jewish gospel. It is an irony of fate that both the Gospel of Matthew and the letters of Paul made into the same canon, the New Testament, one is very articulate about emphasis on the Law of Moses and the latter are an un-apologetic advocate of a new recipe called atonement, a belief in some magical power of death of one man, Jesus of Nazareth, or was he a hybrid, a perfect man and fully divine? The Gospel of Matthew, according to Papias a second century Christian writer was a collection of the sayings of Jesus and was first written in Hebrew. What is not certain, however, is whether he is referring to what we know as the Gospel of Matthew in the New Testament. For the film, see The Gospel According to St. Matthew (film). The Gospel According to Matthew (Greek: κατὰ Ματθαῖον εὐαγγέλιον, kata Matthaion euangelion, τὸ εὐαγγέλιον κατὰ Ματθαῖον, to euangelion kat ta Matthaion) commonly shortened to the Gospel of Matthew, is one of the four Canonical gospels and is the first book of the New Testament. This synoptic gospel is an account of the life, ministry, death, and resurrection of Jesus of Nazareth. It details his story from his genealogy to his Great Commission. The Gospel of Matthew is closely aligned with first-century Judaism, and has been linked to the Jewish-Christian Gospels. It stresses how Jesus fulfilled Jewish prophecies. Certain details of Jesus’ life, of his infancy in particular, are only related by Matthew. His is the only gospel to mention the Church or ecclesia. Matthew also emphasizes obedience to and preservation of biblical law. Since this gospel has rhythmical and often poetical prose, it is well suited for public reading, making it a popular liturgical choice. Most scholars believe the Gospel of Matthew was composed in the latter part of the first century by a Jewish Christian. Early Christian writings state that Matthew the Apostle wrote the Hebrew Gospel. Many scholars today believe that “canonical Matt was originally written in Greek by a non eyewitness whose name is unknown to us and who depended on sources like Mark and Q“. However, other scholars disagree variously on these points. The Gospel of Matthew can be broken down into into five distinct sections: the Sermon on the Mount (ch 5-7), the Mission Instructions to the Twelve (ch 10), the Three Parables (ch 13), Instructions for the Community (ch 18), and the Olivet Discourse (ch 24-25). Some believe this was to reflect the Pentateuch. Traditionally, (see Augustinian hypothesis), Matthew was seen as the first Gospel written, that Luke then expanded on Matthew, and that Mark is the conflation of both Matthew and Luke. It was believed that the Gospel of Matthew was composed by Matthew, a disciple of Jesus. However, 18th Century scholars increasingly questioned the traditional view of composition. Today, most critical scholarship agrees that Matthew did not write the Gospel which bears his name, preferring instead to describe the author as an anonymous Jewish Christian, writing towards the end of the first century. They also believe that the Gospel was originally composed in Greek (see Greek primacy) rather than being a translation from an Aramaic Matthew or the Hebrew Gospel. The Gospels of Mark, Matthew and Luke (known as the Synoptic Gospels) include many of the same episodes, often in the same sequence, and sometimes even in the same wording. The relationship of Gospel of Matthew to the Gospels of Mark and Luke is an open question known as the synoptic problem. Although the author of Matthew wrote according to his own plans and aims and from his own point of view, the great amount of overlap in sentence structure and word choice indicates that Matthew copied from other Gospel writers, or they copied from each other, or they all copied from another common source. This synoptic problem increasingly caused 18th Century scholars to question the traditional view of composition. One solution to the Synoptic problem is the Farrer hypothesis, which theorizes that Matthew borrowed material only from Mark, and that Luke wrote last, using both earlier Synoptics. The most popular view in modern scholarship is the two-source hypothesis, which speculates that Matthew borrowed from both Mark and a hypothetical sayings collection, called Q (for the German Quelle, meaning “source”). For most scholars, the Q collection accounts for what Matthew and Luke share — sometimes in exactly the same words — but are not found in Mark. Examples of such material are the Devil’s three temptations of Jesus, the Beatitudes, the Lord’s Prayer and many individual sayings. A minority of scholars continued to defend the tradition, which asserts Matthean priority, with Mark borrowing from Matthew (see: Augustinian hypothesis and Griesbach hypothesis). Then in 1911, the Pontifical Biblical Commission asserted that Matthew was the first gospel written, that it was written by the evangelist Matthew, and that it was written in Aramaic. In The Four Gospels: A Study of Origins (1924), Burnett Hillman Streeter argued that a third source, referred to as M and also hypothetical, lies behind the material in Matthew that has no parallel in Mark or Luke. This Four Source Hypothesis posits that there were at least four sources to the Gospel of Matthew and the Gospel of Luke: the Gospel of Mark, and three lost sources: Q, M, and L.
According to this view, the first Gospel is a combination of the traditions of Jerusalem, Antioch, and Rome, while the third Gospel represents Caesarea, Antioch, and Rome. The fact that the Antiochene and Roman sources were reproduced by both Evangelists Matthew and Luke was due to the importance of those Churches. Streeter thought there is no evidence that the other sources are less authentic. Throughout the remainder of the 20th century, there were various challenges and refinements of Streeter’s hypothesis. For example, in his 1953 book The Gospel Before Mark, Pierson Parker posited an early version of Matthew (Aram. M or proto-Matthew) as the primary source. Parker argued that it was not possible to separate Streeter’s “M” material from the material in Matthew parallel to Mark. The consensus view of the contemporary New Testament scholars is that the Gospel of Matthew was originally composed in Greek not Hebrew or Aramaic, and that the apostle Matthew did not write the Gospel that bears his name. The first reference to the Hebrew text written by the disciple Matthew comes from Papias  Papias starts by discussing the origin of the Gospel of Mark, and then further remarks that “Matthew composed the logia in the Hebrew tongue and each one interpreted them as he was able”. According to Ehrman this is not a reference to the canonical gospel, since the canonical Gospel of Matthew was originally written in Greek and not Hebrew. Apart from Papias’ comment, we do not hear about the author of the Gospel until Irenaeus  around 185 who remarks that Matthew also issued a written Gospel of the Hebrews in their own language while Peter and Paul were preaching at Rome and laying the foundations of the Church. Pantaenus, Origen and other Early Church Fathers also believed Matthew wrote the Gospel of the Hebrews. Finally, the Church Fathers never asserted that Matthew wrote the Greek Gospel found in the Bible. A study of the external evidence, shows that there existed among the Nazarene and Ebionite Communities, a gospel commonly referred to as the Gospel of the Hebrews. It was written in Aramaic and its authorship was attributed to St. Matthew. Indeed, the Fathers of the Church, while the Gospel of the Hebrews was still being circulated and read, always referred to it with respect. The Early Church Fathers (Irenaeus, Clement of Alexandria, Irenaeus Origen, Jerome etc) all made reference to this gospel of Matthew. As a disciple, Matthew followed Christ, and was one of the witnesses of the Resurrection and the Ascension. Matthew along with Mary, James the brother of Jesus and other close followers of the Lord, withdrew to the Upper Chamber, in Jerusalem. At about this time James succeeded his brother Jesus of Nazareth as the leader of this small Jewish sect. They remained in and about Jerusalem and proclaimed that Jesus son of Joseph was the promised Messiah. These early Jewish Christians were thought to have been called Nazarenes. It is near certain that Matthew belonged to this sect, as both the New Testament and the early Talmud affirm this to be true. Matthew is said to have died a natural death either in Ethiopia or in Macedonia. However, the Roman Catholic Church and the Orthodox Church say he died a martyr. Matthew was also said to have written the very first Gospel  in Hebrew near Jerusalem for Hebrew Christians and it was translated into Greek, but the Greek copy was lost. The Hebrew original was kept at the Library of Caesarea. The Nazarene Community transcribed a copy for Jerome  which he used in his work. Matthew’s Gospel was called the Gospel according to the Hebrews  or sometimes the Gospel of the Apostles  and it was once believed that it was the original to the Greek Matthew found in the Bible, but this has been largely disproved by modern Biblical Scholars. The date of this gospel is still a matter of debate among Biblical scholars. Some believe it was composed between the years 70 and 100, but others claim that there is absolutley no way that it could have been written in this time given the average lifespan of most people at that time. Ignatius seemed to have knowledge of four Pauline epistles and the Gospel of Matthew” , which gives a terminus ad quem of c. 110. The author of the Didache (c 100) probably knew it as well. Many scholars see the prophecy of the siege and destruction of Jerusalem  as suggesting a date of composition after the year 70. However, John A. T. Robinson argues that the lack of a passage indicating the fulfillment of the prophecy suggests an earlier date. . Futhermore the Gospel of Matthew does not mention the death of James in 62 nor the persecutions of the early Christians by Nero. Matthew also divides his work into great blocks each ending with the phrase: “When Jesus had finished these sayings …” This narrative framework echoes that of the Hexateuch: “the birth narratives/Genesis; the baptism in the Jordon and Jesus’ temptations/Exodus; healing of a leper and an untouchable woman/Leviticus; callings of disciples/Numbers; the Passion and Death of Jesus/Deuteronomy; the Resurrection/Joshua (the entry into promised land)”. Graham N. Stanton discounts the suggestion that the “five” discourses are an imitation of the first five books of the Old Testament arguing that many Jewish and Greco-Roman writings have five divisions or sections. For convenience, the Gospel of Matthew can be divided into its four structurally distinct sections: Two introductory sections; the main section, which can be further broken into five sections, each with a narrative component followed by a long discourse of Jesus; and finally, the Passion and Resurrection section. Containing the genealogy, the birth, and the infancy of Jesus (Matthew 1; Matthew 2). The discourses and actions of John the Baptist preparatory to Christ’s public ministry (Matthew 3; Matthew 4:11). The discourses (and actions) of Christ (4:12–26:1). The Parable Discourse, stories that teach about the Kingdom of Heaven(13). The “Church Order” Discourse, concerning relationships among disciples (18–19:1). The Olivet Discourse on the Last Things: his Second Coming, Judgement of the Nations, and the end of the age (24–25). The sufferings, death and Resurrection of Jesus, the Great Commission(26-28). Matthew (like Luke) provides a genealogy and an infancy narrative of Jesus. Although the two accounts differ, both agree on Jesus being both Son of David, and Son of God, and on his virgin birth, and according to Howard W. Clarke, that Jesus’ status as the long-awaited Messiah and as the Son of God was assured before his birth rather than being conferred later in his ministry or acquired after his death. After giving a genealogy from Abraham to Jesus, Matthew gives the number of generations from Abraham to David, from David to the deportation to Babylon, and from the deportation to Jesus as fourteen each. (In fact, the total number of men in the list, including both Abraham and Jesus, is only 41 in the Greek texts whereas the Syriac Curetonian, Syriac Sinaitic, and Dutillet Matthew have 42). Matthew traces the genealogy of Jesus through Joseph, not Mary. 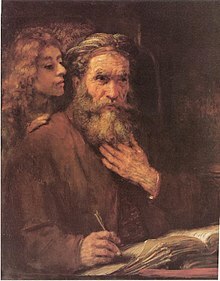 Matthew puts Joseph a descendant of David’s son Solomon while in Luke he is descended from another son of David, Nathan. After David, the lists coincide again at Shealtiel and Zerubbabel (founder of the second temple) but then again part company until they reach Joseph through his father (Jacob according to Matthew; Heli in Luke). These and other differences between Matthew’s and Luke’s genealogy have presented a problem for both ancient and modern readers of the Gospels. An early explanation given by Julius Africanus, was that supposedly on the authority of Jesus family, involving levirate marriage, Joseph’s official father was not his biological father (see Genealogy of Jesus). Some have suggested that Matthew wants to underscore the birth of a messianic child of royal lineage (mentioning Solomon) whereas Luke’s genealogy is priestly (mentioning Levi, but note that the Levi in question is not the ancestor of the Levites but rather the grandfather of Heli). According to Scott Gregory Brown, the reason for the difference between the two genealogies is that it was not included in the written accounts that the writers of the two Gospels shared (i.e. Gospel of Mark and Q). Two other common reasons are (1) Luke presents Mary’s genealogy, while Matthew relates Joseph’s; (2) Luke has Jesus’ actual human ancestry through Joseph, while Matthew gives his legal ancestry by which he was the legitimate successor to the throne of David. According to Howard W. Clarke, the two accounts cannot be harmonized and today the genealogy accounts are generally taken to be “theological” constructs. Taken this way, writes Stanton, the genealogy foreshadows acceptance of Gentiles into the Kingdom of God: in reference to Jesus as “the Son of Abraham”, the author has in mind the promise given to Abraham in Gen 22:18. Matthew holds that due to Israel’s failure to produce the “fruits of the kingdom” and her rejection of Jesus, God’s kingdom is now taken away from Israel and given to Gentiles. Another foreshadowing of the acceptance of Gentiles is the inclusion of four women in the genealogy (three of whom were Gentiles), something unexpected to a first century reader. According to Stanton, women are probably representing non-Jews to a first century reader. According to Markus Bockmuehl et al., Matthew is mentioning this to prepare his reader for the apparent scandal surrounding Jesus’ birth by emphasizing the point that God’s purpose is sometimes worked out in unorthodox and surprising ways. Mary becomes pregnant “of the Holy Spirit“, and so Joseph decides to break his relationship with her quietly. He however has a dream with the promise of the birth of Jesus. The gospel proceeds with visit of the Magi who acknowledge the infant Jesus as king. This is followed by Herod’s massacre of the innocents and the flight into Egypt, and an eventual journey to Nazareth. According to Mary Clayton, the chief aim of the infancy narrative is to convince readers of the divine nature of Jesus through his conception through the Holy Spirit and his virgin birth; the visit of Magi and flight into Egypt intended to show that Jesus’ kingship is not restricted to Jews but is rather universal. John baptizes Jesus, and the Holy Spirit descends upon him. The evangelist addresses the puzzling scene of Jesus, reputedly born sinless, being baptized. He omits reference to baptism being for forgiveness of sins and depicts John emphasizing his inferiority to Jesus. The descent of the Holy Spirit tells the reader that Jesus has become God’s anointed (Messiah or Christ). Jesus prays and meditates in the wilderness for forty days, and then is tempted by the Devil. Jesus refutes the Devil with quotations from Jewish Law. Matthew’s principal addition to Mark’s narrative is five collections of teaching material, and the first is the Sermon on the Mount. Jesus, presented as a greater Moses, completes and transcends Mosaic law. The Beatitudes bless the poor in spirit and the meek. In six expositions or antitheses (depending on how the sermon is interpreted, see Expounding of the Law), Jesus reinterprets the Law. He offers the Lord’s prayer as a simple alternative to ostentatious prayer. The Lord’s prayer contains parallels to First Chronicles 29:10-18. Critical scholars see the historical Jesus in his startling congratulations to the unfortunate and his call to return violence with forgiveness (“turn the other cheek”, see also Evangelical counsels). Matthew’s beatitudes differ from those found in Luke. The paradoxical blessings in Luke to the poor and hungry are here blessings to the poor in spirit and those who hunger for justice. In addition, Matthew has more blessings than Luke, the extras apparently derived from Psalms and from numerous precedents for virtues being rewarded. Matthew names the Twelve Disciples. Jesus sends them to preach to the Jews, perform miracles, and prophesy the imminent coming of the Kingdom. Jesus commands them to travel lightly, without even a staff or sandals. He tells them they will face persecution. Scholars are divided over whether the rules originated with Jesus or with apostolic practice. Jesus tells the parable of the sower, paralleling Mark. Like Mark and Luke, Matthew portrays Jesus as using parables in order to prevent the unworthy from receiving his message. The parables of the wheat and the tares and of the net, unique to Matthew, portray God’s sure judgment as indefinitely delayed. The parables of the mustard seed and of the pearl “of very special value” emphasize the secret nature and incomprehensible worth of the Kingdom. Matthew is the only Gospel to discuss the ecclesia (Greek: assembly), or church. In Matthew, Jesus establishes his church on Peter, giving Peter and the Church the power to bind and loose (or forbid and allow). The instructions for the church emphasize ecclesiastical responsibility and humility. He calls on his disciples to practice forgiveness, but he also gives them the authority to excommunicate the unrepentant. Peter’s special commission has been highly influential (see Saint Peter). Jesus heaps the “seven woes” on the scribes and Pharisees. This hostility is thought to represent the attitude of the first-century church. Matthew expands Marks’ account of the Parousia, or Second Coming. Matthew mentions such things as false Messiahs, earthquakes, and persecution of his disciples, but states that these are not signs of the end times. After the tribulation, the sun, moon, and stars will fail. The declaration that his generation would not pass away before all the prophecies are fulfilled indicates that the author thought himself to be living in the last days. This discourse might incorporate two different Parousia traditions, one with typical apocalyptic signs and the other emphasizing that the Master will return without warning. The parables of the foolish virgins and of the talents emphasize constant readiness and Jesus’ unexpected return. In a prophetic vision, Jesus judges the world. The godly (“sheep”) are those who helped those in need, while the wicked (“goats”) are those who did not. Matthew generally follows Mark’s sequence of events. Jesus triumphantly enters Jerusalem and drives the money changers from the temple. He identifies Judas Iscariot as his traitor. Jesus prays to be spared the coming agony, and a mob takes him by force to the Sanhedrin. To the trial, Matthew adds the detail that Pilate‘s wife, tormented by a dream, tells him to have nothing to do with “that righteous man”, and Pilate washes his hands of him. To Mark’s account of Jesus’ death, Matthew adds the occurrence of an earthquake, and saints arising from their tombs and appearing to many people in Jerusalem (Matthew 27:51-53). He also provides two stories of the Jewish leaders conspiring to undermine belief in the resurrection (Matthew 28:11-15), and he describes Mark’s “young man” at Jesus’ tomb as being a radiant angel (Matthew 28:3). Matthew does not relate any of Jesus’ post-resurrection appearances to the disciples in Judea, nor his Ascension. He appears to the Eleven in Galilee and commissions them to preach to the world: “Go therefore and make disciples of all nations baptizing them in the name (singular) of the Father of the Son and of the Holy Spirit”… and that name is Jesus (Matthew 28:19). Of note is the phrase “Kingdom of Heaven” (ἡ βασιλεία τῶν οὐρανῶν) used often in the gospel of Matthew, as opposed to the phrase “Kingdom of God” used in other synoptic gospels such as Luke. The phrase “Kingdom of Heaven” is used 32 times in 31 verses in the Gospel of Matthew. It is speculated that this indicates that this particular Gospel was written to a primarily Jewish audience, such as the Jewish Christians, as many Jewish people of the time felt the name of God was too holy to be written. Matthew’s abundance of Old Testament references also supports this theory. The theme “Kingdom of Heaven” as discussed in Matthew seems to be at odds with what was a circulating Jewish expectation—that the Messiah would overthrow Roman rulership and establish a new reign as the new King of the Jews. Christian scholars, including N. T. Wright (The Challenge of Jesus) have long discussed the ways in which certain 1st-century Jews (including Zealots) misunderstood the sayings of Jesus—that while Jesus had been discussing a spiritual kingdom, certain Jews expected a physical kingdom. See also Jewish Messiah. While Paul’s epistles and the other Gospels emphasize Jesus’ international scope, Matthew addresses the concerns of a Jewish audience. The cast of thought and the forms of expression employed by the writer show that this Gospel was written by a Jewish Christian of Iudaea Province. Portions of the oral sayings in Matthew contain vocabulary that indicates Hebrew or Aramaic linguistic techniques involving puns, alliterations, and word connections. Hebrew/Aramaic vocabulary choices possibly underlie the text in Matthew 1:21, 3:9, 4:12, 4:21-23, 5:9-10, 5:23, 5:47-48, 7:6, 8:28-31, 9:8, 10:35-39, 11:6, 11:8-10, 11:17, 11:29, 12:13-15, 12:39, 14:32, 14:35-36, 15:34-37, 16:18, 17:05, 18:9, 18:16, 18:23-35, 19:9-13, 19:24, 21:19, 21:37-46, 21:42, 23:25-29, 24:32, 26:28-36, 26:52. The one aim pervading the book is to show that Jesus of Nazareth was the promised Messiah — he “of whom Moses in the law and the prophets did write” — and that in him the ancient prophecies had their fulfilment. This book is full of allusions to passages of the Old Testament which the book interprets as predicting and foreshadowing Jesus’ life and mission. This Gospel contains no fewer than sixty-five references to the Old Testament, forty-three of these being direct verbal citations, thus greatly outnumbering those found in the other Gospels. Matthew uses Old Testament quotations out of context (as is common in Jewish writings such as the Talmud), as individual lines or even letters of Scripture were said to have inspired meanings different from the original ones. The main feature of this Gospel may be expressed in the motto “I am not come to destroy [the Law and the Prophets], but to fulfill” (5:17). See also Expounding of the Law. It was the contention of Marcion that Christ had come to destroy the law. See Biblical law in Christianity for the modern debate. This Gospel sets forth a view of Jesus as Messiah and portrays him as an heir to King David’s throne, the rightful King of the Jews. Matthew’s genealogy, the wise men of the east, the massacre of the innocents, and the flight into Egypt affirm Jesus’ kingship and liken him to Moses. Matthew regards Jesus as a greater Moses. He arranges Jesus’ sermons into five discourses, probably parallel to the five Books of Moses, the Torah. Matthew affirms Jesus’ authority to give the eternal law of Moses a new meaning. While addressing Jewish concerns, Matthew also addresses the universal nature of the church in the Great Commission (which is directed at “all nations”). See Interpretations of the Sermon on the Mount and Christian view of the Law. In terms of chronology Matthew agrees with the other gospels that Jesus’ public ministry began with an encounter with John the Baptist. Then Matthew (and the two other synoptic Gospels) mention teaching and healing activities of Jesus in Galilee. This is followed by a trip to Jerusalem marked by an incident in the Temple. Jesus is crucified on the day of the Passover holiday. John by contrast puts the Temple incident very early in Jesus’ ministry and depicts several trips to Jerusalem. The crucifixion is also placed the day before the Passover holiday, when the lambs for the Passover meal were being sacrificed in Temple. In modern scholarship a new consensus is emerging which dates the Didache (part of the Apostolic Fathers collection), at about the turn of the 1st century. At the same time, significant similarities between the Didache and the Gospel of Matthew have been found as these writings share words, phrases, and motifs. There is also an increasing reluctance of modern scholars to support the thesis that the Didache used Matthew. This close relationship between these two writings might suggest that both documents were created in the same historical and geographical setting. One argument that suggests a common environment is that the community of both the Didache and the Gospel of Matthew was probably composed of Judaeo-Christians from the beginning, though each writing shows indications of a congregation which appears to have alienated itself from its Jewish background (see also List of events marking the split between early Christianity and Judaism). Also, the Two Ways teaching (Did. 1-6) may have served as a pre-baptismal instruction within the community of the Didache and Matthew. Furthermore, the correspondence of the Trinitarian baptismal formula in the Didache and Matthew (Did. 7 and Matt 28:19) as well as the similar shape of the Lord’s Prayer (Did. 8 and Matt 6:5-13) apparently reflect the use of resembling oral forms of church traditions. Finally, both the community of the Didache (Did. 11-13) and Matthew (Matt 7:15-23; 10:5-15, 40-42; 24:11,24) were visited by itinerant apostles and prophets, some of whom were illegitimate. 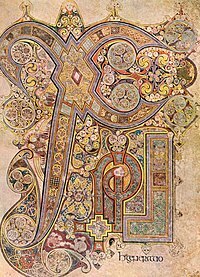 In Insular Gospel Books (copies of the Gospels produced in Ireland and Britain under Celtic Christianity), the first verse of Matthew’s genealogy of Christ was often treated in a decorative manner, as it began not only a new book of the Bible, but was the first verse in the Gospels. ^ a b c d e f g h i j k l m n Harris, Stephen L., Understanding the Bible. Palo Alto: Mayfield. 1985. ^D. R. W. Wood, New Bible Dictionary (InterVarsity Press, 1996), 739. ^ Synopticsentry in Catholic Encyclopedia. ^ Pierson Parker. The Gospel Before Mark. Chicago: University of Chicago Press, 1953. ^ Everett Falconer Harrison, Introduction to the New Testament, Wm. Eerdmans 1971, p. 152. ^ Papius was born about thirty years after the crucifixion and eventually became Bishop of Hierapolis in Asia Minorfl. first half of the second century. ^ The interpretation of the above quote from Papias depends on the meaning of the term logia. The term literally means “oracles”, but the intended meaning by Papias has been controversial. ^Irenaeus was a Christian Bishop of Lugdunum in Gaul, part of the Roman Empire. He was an Early Church Father and apologist, and his writings were formative in the early development of Christian theology. He was a disciple of Polycarp, who in turn was a disciple of John the Evangelist. ^ “St. Matthew”. Catholic Encyclopedia. New York: Robert Appleton Company. 1913. http://en.wikisource.org/wiki/Catholic_Encyclopedia_(1913)/St._Matthew. ^Ehrman 2004, p. 110 and Harris 1985 both specify a range c. 80-85; Gundry 1982, Hagner 1993, and Blomberg 1992 argue for a date before 70AD. ^ John A. T. Robinson (1976). Redating the New Testament. Wipf & Stock. ISBN 1579105270. ^Howard W. Clarke (2003), p. 1: According to Clarke, this is because some Pauline epistles give the impression that Jesus’ divinity was confirmed only by his death, resurrection and ascension. ^Craig Blomberg, vol. 22, Matthew, electronic ed., Logos Library System; The New American Commentary (Nashville: Broadman & Holman Publishers, 2001, c1992), p.53. ^ a b c d e Funk, Robert W., Roy W. Hoover, and the Jesus Seminar. The five gospels.HarperSanFrancisco. 1993. ^H. van de Sandt (ed), Matthew and the Didache, ( Assen: Royal van Gorcum; Philadelphia: Fortress Press , 2005). Blomberg, Craig L., Matthew, The New American Commentary22. Broadman, 1992. Bockmuehl, Markus and Donald A. Hagner, The Written Gospel, Cambridge University Press, 2005, ISBN 0521832853. Pierre Bonnard, L’Évangile selon saint Matthieu, Labor et Fides, 2002. Brown, Raymond E., Introduction to the New Testament, Anchor Bible, 1997, ISBN 0-385-24767-2. Brown, Scott Gregory, Mark’s Other Gospel: Rethinking Morton Smith’s Controversial Discovery, Wilfrid Laurier University Press, 2005, ISBN 0889204616. Carson, D.A., Douglas J. Moo, and Leon Morris: An introduction to the New Testament Apollos, 1992, ISBN 085111766X. Clarke, Howard W., Howard W. Clarke, The Gospel of Matthew and Its Readers, Indiana University Press, 2003. Clayton, Mary, The Apocryphal Gospels of Mary in Anglo-Saxon England, Cambridge University Press, 1998, ISBN 0521581680. Davies, W. D., and Dale C. Allison: A Critical and Exegetical Commentary on the Gospel According to Saint Matthew, Continuum International Publishing Group, 1997 ISBN 056708518X. Ehrman, Bart D., Bart D. Ehrman, The New Testament: A Historical Introduction to the Early Christian Writings. New York: Oxford, (2004), ISBN 0-19-515462-2. Green, Michael, The Message of Matthew. The Kingdom of Heaven. Bible Speaks Today. InterVarsity Press, Downers Grove 2001 ISBN 0-8308-1243-1. Gundry, Robert Horton: Matthew, a Commentary on His Literary and Theological Art, W.B. Eerdmans Pub. Co., 1982, ISBN 080283549X. Hagner, Donald Alfred, Matthew 1-13 Word Biblical Commentary, Word Books, 1993. Harris, Stephen L., Understanding the Bible, Palo Alto: Mayfield, 1985. Howard Clark Kee, part 3, The Cambridge Companion to the Bible, Cambridge University Press, 1997. Kupp, David D., Matthew’s Emmanuel: Divine Presence and God’s People in the First, Cambridge University Press, 1996, ISBN 0521570077. Mills, Watson E., Richard F. Wilson and Roger Aubrey Bullard, Mercer Commentary on the *New Testament, Mercer University Press, 2003. Pick, Bernhard, The Gospel According to the Hebrews, Publisher Kessinger Publishing, 2005. Stevenson, Kenneth. The Lord’s prayer: a text in tradition, Fortress Press, 2004. ISBN 0800636503. Stanton, Graham N., The Gospels and Jesus, Oxford University Press, 1989. Thiede, Carsten Peter, Papyrus Magdalen Greek 17 (Gregory–Aland P64) 1995. A Reappraisal” (PDF). Zeitschrift für Papyrologie und Epigraphik 105: 13–20. Retrieved 2006-12-13. A textual commentary on the Gospel of MatthewDetailed text-critical discussion of the 300 most important variants of the Greek text (PDF, 438 pages). Early Christian Writings Gospel of Matthew: introductions and e-texts. 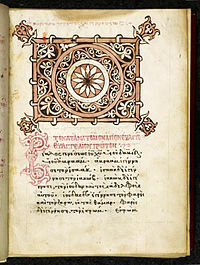 “Gospel According to Matthew.” Encyclopædia Britannica. 2010. Encyclopædia Britannica Online. 06 Apr. 2010 <http://www.britannica.com/EBchecked/topic/369708/Gospel-According-to-Matthew&gt;. Bart Ehrman. The Historical Jesus. The Teaching Company Course. Lecture 5.